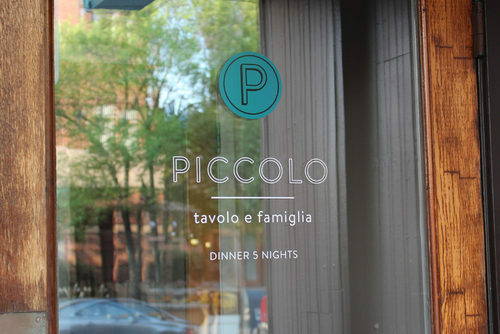 Piccolo, a small "modern classic" Italian restaurant with influences from Calabria and Abruzzi, had a soft opening last night and will open to the public tomorrow at 5 p.m. The highly anticipated spot is from the husband and wife team of Damian Sansonetti and Ilma Lopez. It's the first time Sansonetti and Lopez have worked together professionally since he was sous chef and she was sous pastry chef at DB Bistro in NYC eight years ago, back before they even began dating. The two resettled in Maine last year and, more recently, had their first child. Sansonetti opened the casual Blue Rooster Food Co. earlier this year and Lopez was the pastry chef at Grace before going on maternity leave. She'll now make the desserts at Piccolo, putting a modern twist on Italian classics (liquid nitrogen will be involved). Sansonetti says he wants the restaurant, which takes over the Bresca space next to the police station on Middle Street, to be "lively and vibrant" in the intimate dining room. "It's like coming to our house and having dinner with us," he says. He said the dim lighting and votive candles lend a "romanticism," but he wants it to be a comfortable spot rather than stiff and formal. Check out the inside for yourself. The restaurant also incorporates a number of personal touches. For instance, the linen napkins were selected because they reminded Sansonetti of the towels his grandmother used to dry pasta on. And Lopez's grandmother made the aprons for the wait staff and the pillows that are placed along the bench seating that runs the length of the wall. The menu "evokes real Italian flavors," Sansonetti says. A number of products are sourced from Italy, like the house olive oil, which comes from Abruzzi. Right after talking with us, Sansonetti was headed back to the kitchen to tend to sardines from the Mediterranean that had arrived at Logan Airport just a few hours earlier. He says they were so fresh, "they're still in rigor mortis." Local products will also play a prominent role on the menu. The ricotta is made in-house with local milk. The eggplant is straight from the farmer's market. Sansonetti said parts of the menu will change weekly and there will be nightly specials. The all-Italian wine list is meant to be accessible but interesting, with nine choices by the glass, priced from $7 to $11. The options are "stuff you won't find in the grocery store," Sansonetti says, adding that each is intended to pair with something on the menu. Piccolo will be open Wednesday through Sunday, from 5 p.m. to 10:30 p.m. A Sunday brunch is in the plans for the future. Right now, reservations can be made by calling (207) 747-5307. Soon, reservations will be available through the website using SeatMe.